If you like using Facebook to keep up with our posts, then this post is for you. Facebook recently changed their algorithms (again) to severely limit the reach of each page’s posts. The reason for this is simple: Facebook needs to generate revenue, and they want page owners to pay to reach their followers. Facebook has severely limited what news you see in your news feed. If you want to see news regarding the Firearms Industry (NO Marketing, just NEWS!) the following list is for you. 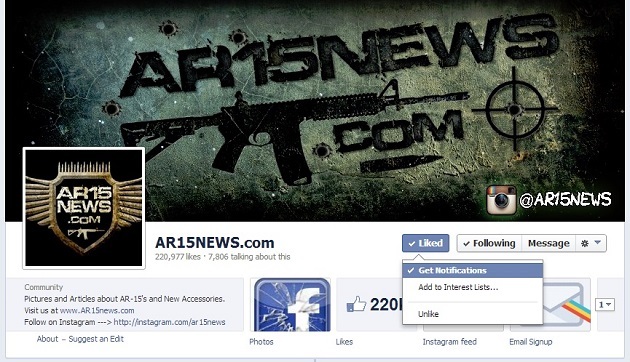 I’ve compiled a list of Firearms Industry news pages I follow and you should too. This list will show you every single post that all of these pages make so you wont miss a thing. Just add the link to your bookmark / links bar and check it every day. The best way to keep up to date with our posts is to sign up for our email notifications. You can do that by using the form below. Long-time subscriber – screw Facebook! Ditto! Thank you for all your work Brandon & Ben!